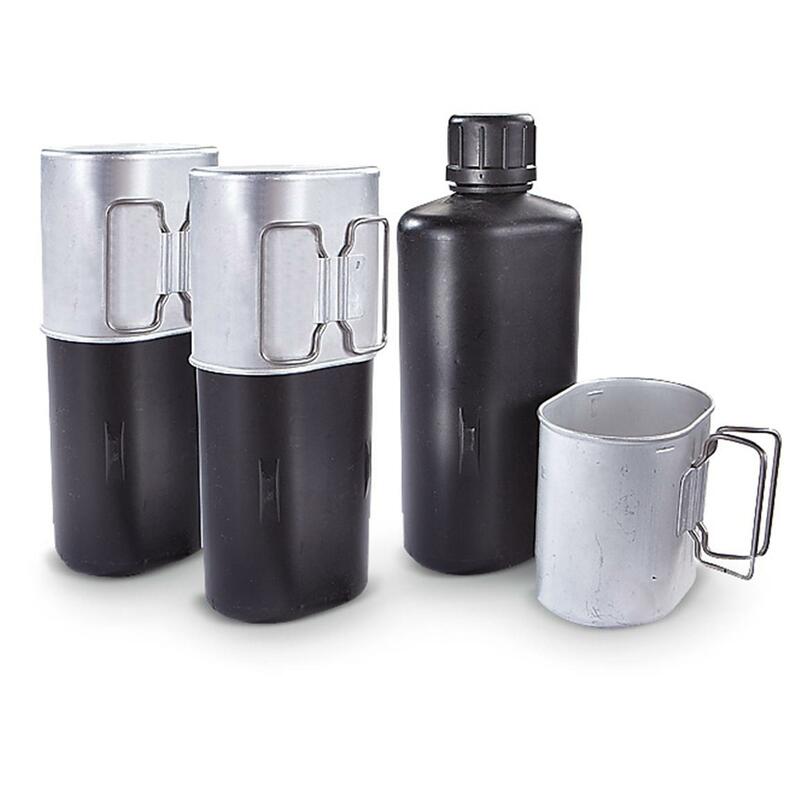 Nab this useful trio of heavy-duty Swiss Military Canteens to keep you and buddies hydrated in the field. Perfect for your bug-out bag or camping supplies. Swiss Military Surplus Canteens with Cups, 3 Pack, Used is rated 3.9 out of 5 by 24. Rated 5 out of 5 by John from Useful Canteen These are a handy size, and fit perfectly in the side pockets of the Swiss pack. Rated 4 out of 5 by NC_Andy from Good value, but not new. They were in good condition and cleaned up well. The canteens and cups are a great deal for the price, but two of them still had soldiers name tags on them, so they definitely are used. Rated 3 out of 5 by Nick from Decent Used Condition, But Not New These canteens are in decent shape for being used, but they should not be listed as new as they are in the title. I have seen that many people have stated the same thing as me, and the listing still continues to say new. That needs to be changed because they are well used and the one canteen I got had a broken cap. Not worth refunding or sending it back, but I wanted to mention it in this review. Other than that, they do work fine and I plan on using them on my next camping trip. Rated 2 out of 5 by hazmatdude from THEY ARE NOT NEW The listing says "New Swiss army surplus" The canteens are definitely not new. They have been heavily used. Rated 2 out of 5 by Boston John from Not New I received the canteens today one looked new two were not new I will be returning them today. It's not long time storage two were used and I don't want used canteens. The value and quality ratings are based on what I received. If they were new all ratings would be excellent. Rated 5 out of 5 by Fsantos from SG rocks A while after i left a bad review on this canteens and the way SG listed them as new when they wasn't new. I got a call from SG staff and they offered me to return the order after i told them that i want to keep them because i expended too long cleaning them they insisted on refund my money with the option of keeping my canteens even when i said that wasn't necessary they still refunded my money. That's why im giving them 5 stars not because the product but because the customer service, it's awesome when you deal with a company that stand behind their business... Thank you SG for the refund. Rated 5 out of 5 by GW702 from Great price! A buddy of mine recently purchased one of these canteens from another vendor. I saw this deal on Sportsman's Guide and placed an order. My package arrived quickly. All three canteens were in very good to excellent condition. However, I noticed a bit of an odor inside the bottles... something of a musty smell perhaps or just the smell of the plastic? Not sure as these are the first plastic canteens I have owned or used. A good cleaning with dish soap and then baking soda solution and suspending the bottles upside down with the caps off seems to alleviate the odor quite a bit. The aluminum cups fit snugly to the bottles and the combo easily goes in and comes out of a side pocket on my ruck as a unit. They are great for use in the car too as the narrow openings prevent spills while driving. I'm very happy with my purchase. A well designed, useful product at a great price!